Heat oven to 425°F. Spray broiler pan with nonstick cooking spray. Spray large nonstick skillet with cooking spray. Add pork chops; cook 2 minutes on each side or until browned. Place chops on sprayed broiler pan. Arrange potato wedges around chops on pan. Brush potatoes with oil. Sprinkle chops and potatoes with salt, pepper blend and thyme. Bake at 425°F. 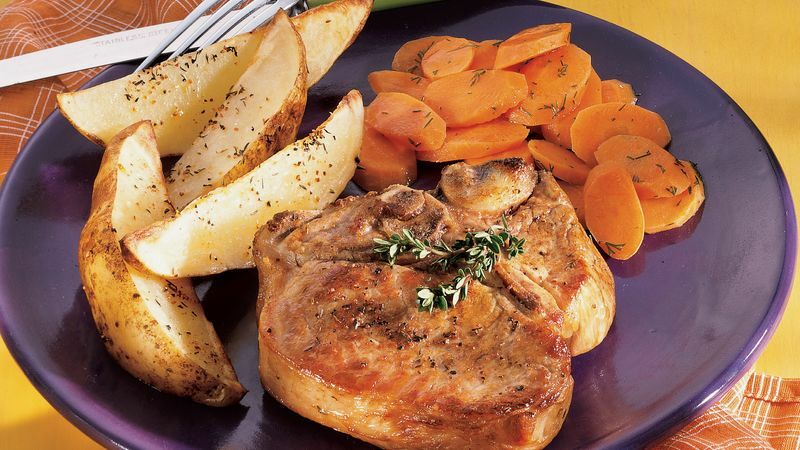 for 30 minutes or until pork chops are no longer pink in center and potatoes are tender. Russet Burbank potatoes, commonly called russet or Idaho, were named after their developer, Luther Burbank of Idaho. These low-moisture, high-starch potatoes are excellent for baking. Accompany this recipe with carrots and coleslaw from the deli.